Continuing on with tips for the traveling photographer, I offer you my 3rd tip: Essential Equipment. Once you have decided where to go and how to get there, you need to ask yourself what you NEED to bring. A medium to large, comfortable quality backpack is probably the most important item. I use a Tamrac Expedition 7 model, which has multiple adjustable and protective compartments for storing several camera bodies and numerous lenses. Before you leave the house or hotel, attach a wide angle lens to one camera body and a standard 18 -50 mm lens to another. Bring ALL of your lenses and camera bodies. You never know when you may need them and it is better to have lugged them around with you and not used them as compared to wishing you had brought them and missing a cool photo opportunity. One or two 4 GB memory cards and charged batteries would be the next most important items. Also, make sure you some foul weather gear as you never know when the elements may surprise you with rain or snow. A hat to shield you from the sun is also recommended as is sun screen lotion. Certainly you want to bring several bottles of water in addition to your photography essentials. No matter where you are staying hydrated is essential to a prolonged and successful photo session. Lastly, and perhaps most importantly, bring your sense of childlike adventure! HAVE FUN!! Below, is an example of having multiple lenses handy and attached to your camera body before leaving the house. In cold weather, such as Stockholm, Sweden in February, you do not want to have to attach a lens to a cold camera body out in the elements. 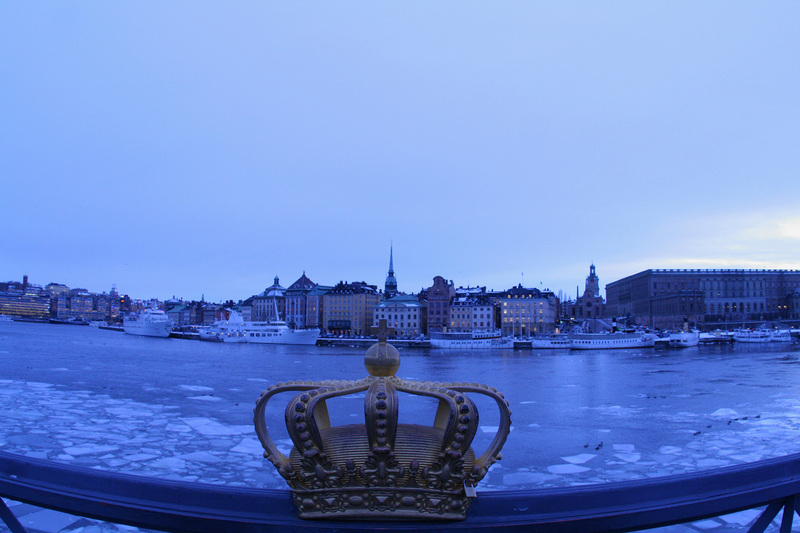 Below is a photo taken from Skeppsholmen Bridge using a fish eye lens.